- IWC Showdown In U-Town III (August 13, '05) = Rowe won a "Proving Ground" Match over Jason Cage. - IWC Accept No Limitations II (February 18, '06) = Rowe fell to Sterling James Keenan. - IWC The Road To Super Indy V (March 18, '06) = Rowe & J-Rocc were beaten by Jason Cage & Dirk Ciglar. - IWC Super Indy Tournament V (April 15, '06) = Rowe & J-Rocc defeated Jason Cage & Dirk Ciglar. - IWC Hell Hath No Fury 2 (May 13, '06) = The Cleveland Mafia (Rowe & J-Rocc) took down Jason Cage & Jimmy DeMarco. - IWC Boiling Point 2 (September 16, '06) = Rowe took down Shirley Doe, then lost to the eventual winner, Ricky Reyes, in the IWC Heavyweight Title Tournament. Later on, the Cleveland Mafia kept the IWC Tag-Team Titles, winning a "Four-Way Elimination" Match over the Gambino Brothers, Sexual Harassment, and Jason Gory & Shiima Xion. - IWC A Call To Arms 3 (December 9, '06) = The Cleveland Mafia lost a "Four-Way" Match to BabyFace Fire, who won the IWC Tag-Team Titles. The Gambino Brothers and Sexual Harassment were the other participants. 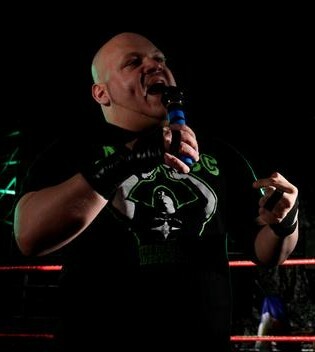 Later on, Rowe competed in a "#1 Contenders Rumble" Match, which was won by Brent Albright. - IWC A New Beginning Too (January 19, '07) = Rowe defeated Vendetta. - IWC Summer Sizzler 4 (July 7, '07) = Rowe was beaten by Samoa Joe. - IWC No Excuses 3 (August 4, '07) = Rowe took down Ricky Reyes. - IWC Revengeance 4 (October 13, '07) = Rowe lost, via ref stoppage, to Ricky Reyes. - IWC November Pain 3 (November 10, '07) = Rowe won an "IWC World Title #1 Contenders" Match over Ricky Reyes. - IWC A Call To Arms 4: Controlled Chaos (December 8, '07) = Rowe lost to the IWC World Heavyweight Champion, Dennis Gregory. - IWC Accept No Limitations 4 (February 16, '08) = Rowe won, via DQ, over J-Rocc. - IWC Night of Legends '08 (April 12) = Rowe & Johnny Gargano were beaten by Sexual Harassment. - IWC Hell Hath No Fury III (May 17, '08) = Rowe fought to a No-Contest with J-Rocc. - IWC No Excuses 4 (August 2, '08) = Rowe defeated Jason Bane. - IWC Boiling Point 3 (September 13, '08) = Rowe won a "Three-Way Elimination IWC Heavyweight Title Tournament Qualifying" Match over John McChesney and Ricky Reyes. - IWC Promotional Consideration Paid For By The Following, Night One (October 25, '08) = Rowe defeated Shane Taylor in the opening round of the IWC World Heavyweight Title Tournament. - IWC Promotional Consideration Paid For By The Following, Night Two (October 26, '08) = Rowe beat Sami Callihan, then fell to the eventual IWC World Heavyweight Title Tournament winnner, Shiima Xion. - IWC November Pain 4 (November 8, '08) = Rowe lost to the IWC World Heavyweight Champion, Shiima Xion. 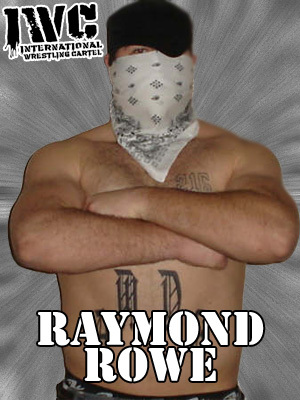 - IWC A Call To Arms 5 (December 20, '08) = The Cleveland Mafia (Rowe, Shane Taylor, & J-Rocc) were beaten by Ricky Reyes & BabyFace Fire. - IWC A New Beginning: Woooooooo! (January 24, '09) = Rowe won the IWC World Heavyweight Title, defeating Shiima Xion. - IWC Accept No Limitations 5 (March 7, '09) = Rowe stayed the IWC World Heavyweight Champion, beating Chest Flexor. Later on, Rowe lost the IWC World Heavyweight Title, losing a "No Disqualification" Match to Shiima Xion. - IWC Night of Legends '09 (March 28) = Rowe lost to the IWC World Heavyweight Champion, Shiima Xion. - IWC Super Indy 8, Night One (May 15, '09) = In a non-tournament match, Rowe, Logan Shulo, Shane Taylor, & Irish Airborne took down Ricky Reyes, Shiima Xion, Eric Xtasy, & The Gambino Brothers. - IWC No Excuses 5 (August 1, '09) = Rowe won, via ref stoppage, over Jimmy DeMarco. - IWC Clearfield Cataclysm (October 3, '09) = Rowe & Shane Taylor lost, via DQ, to Jimmy DeMarco & John McChesney. Later on, The Cleveland Mafia (Rowe, Shane Taylor, & J-Rocc) fell to Jimmy DeMarco, John McChesney, & Jimmy Snuka. - IWC November Pain 5 (November 14, '09) = Rowe lost to Hernandez. - IWC A Call To Arms 6: Prelude (December 11, '09) = The Cleveland Mafia (Rowe & J-Rocc) won a "Four Way" Match over BabyFace Fire, Sexual Harassment, and Jimmy DeMarco & Marshall Gambino. - IWC A Call To Arms 6: Full Circle (December 12, '09) = Rowe lost, via DQ, to Jon Bolen. - IWC Kickoff '10 (January 30) = The Cleveland Mafia (Rowe & Shane Taylor) fought to a Double Countout with Michael Facade & Dean Radford. - IWC Clearfield Cataclysm 2 (March 6, '10) = Rowe & Shiima Xion fell to Jon Bolen & The Patriot. - IWC Road To Super Indy IX (April 17, '10) = Rowe lost to the IWC World Heavyweight Champion, Jimmy DeMarco. - IWC Super Indy X (June 18, '11) = In a non-tournament match, Rowe lost, via DQ, to the IWC World Heavyweight Champion, John McChesney. - IWC Caged Fury '11 (August 20, '11) = Rowe, Jimmy DeMarco, & Flippin' Ain't Easy won a "War Games" Match over The Founding Fathers (Dennis Gregory, John McChesney, Jimmy Vega$, & Bubba The Bulldog). - IWC No Excuses: 10th Anniversary Show (October 22, '11) = Rowe lost an "I Quit" Match, via ref stoppage, to the IWC World Heavyweight Champion, John McChesney.